The University of California San Diego is listed first in a new Times Higher Education ranking of the world’s top “Golden Age” universities—the best 100 institutions that were founded between 1945 and 1966. Times Higher Education, a London-based publication, notes that the Golden Age in global higher education was characterized by rapid university expansion and increasing investment in research. Times Higher Education cites UC San Diego’s innovative approach to education for netting the number one spot on their list. For example, while the scholarly study of psychology dates back to ancient Greece, UC San Diego was the first institution to establish cognitive science as a discipline with the launch of the world’s first university department in the subject in 1986. The university’s college system is also groundbreaking: each of its six colleges has a different theme, such as the environment or internationalization, but all subject majors are available at every college. This means that students can pick both a theme and a subject in which they want to focus during their degree, which promotes interdisciplinary study and aims to prepare them well for the workplace. This recognition from Times Higher Education builds on other accolades UC San Diego has received, including the recent designation as a Changemaker Campus by Ashoka U for its role as a leader in social innovation education. UC San Diego also has been named the top public university in Washington Monthly’s rankings of universities contributing to the public good for six consecutive years. And, the campus was named the 7th best public university across the globe by the 2016-17 Times Higher Education World University Rankings. UC San Diego is a world-class university thanks to philanthropic investment. Taner Halicioglu, an alumnus and Facebook’s first fulltime hire, recently gave a $75 million gift that kicked off the Campaign for UC San Diego. The gift will establish an institute for data science on campus. “Data science touches so many areas—biology, physics, chemistry, medicine, computer science, math,” said Halicioglu. He cites personalized medicine as an example of what could be accomplished with data science. 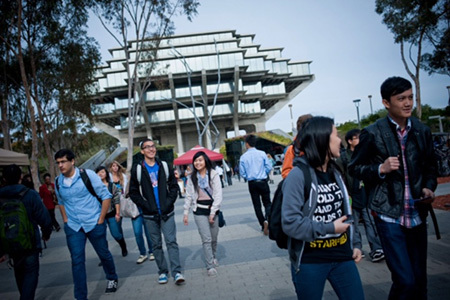 For more information about UC San Diego’s rankings and distinctions, visit our Campus Profile.